Gold prices rose further in the domestic bullion market today due to continued buying from jewellery stockists and retail consumers, driven by a strong global sentiment. Silver, too, witnessed a sharp movement, due to a heavy speculative offtake coupled with higher industrial offtake. 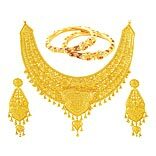 Standard gold (99.5 purity) spurted by Rs 100 to end at Rs 26,800 per 10 grams from overnight Rs 26,700. Pure gold (99.9 purity) climbed by Rs 105 to conclude at Rs 26,950 per 10 grams as against Rs 26,845. Silver (.999 fineness) jumped by Rs 480 to finish at Rs 41,565 per kg as compared with Rs 41,085 yesterday. Globally, the shiny metal made a strong comeback after a recent sharp sell-off and hit its highest level in two weeks on bargain-hunting supported by short-covering bounces. Gold for August delivery firmed up to settle at USD 1,260.10 an ounce on the Comex division of the NYMEX late yesterday, while silver gained to end at USD 19.17 an ounce.